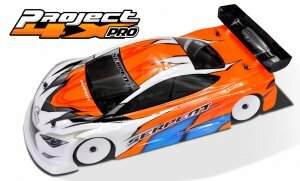 The Serpent Project 4X PRO is a logical evolution over the 4X EVO. it shares all features of the 4x evo including the same easy to build and setup shock system and fixed-length pullrods, while the vertical topdeck is replaced by a horizontal topdeck for more aggressive steering on high grip surfaces and the rear suspension is heavily modified with much longer arms and a different geometry to create more steering and widen the setup window on medium to high grip asphalt. For maximum rear stability and steering precision which is needed in stock classes, there is a fixed-toe rear wheelcarrier included in the kit. New rear suspension. Race proofed with multiple ETS A final results and Podium at the IFMAR World Championship. Fixed-toe rear with special geometry for stock racing with maximum rear stability and precision, both options included in the kit. New horizontal topdeck for more steering on high grip surfaces. 2MM carbon fibre chassis with additional holes in the chassis plate for more flex options. RRS rear end with new geometry, both options included in the kit. Large heave damper with more oil and bigger springs and easy-bleeding system for precise rebound setting. Same heave damper front and rear which is mounted below the diff/spool just above the chassis for lowest possible center of gravity.